After only returning to training two weeks ago following their South African 'safari', it was always going to take time for All-Ireland champions Dublin to hit full stride. Once they did, the result was as devastating as ever. 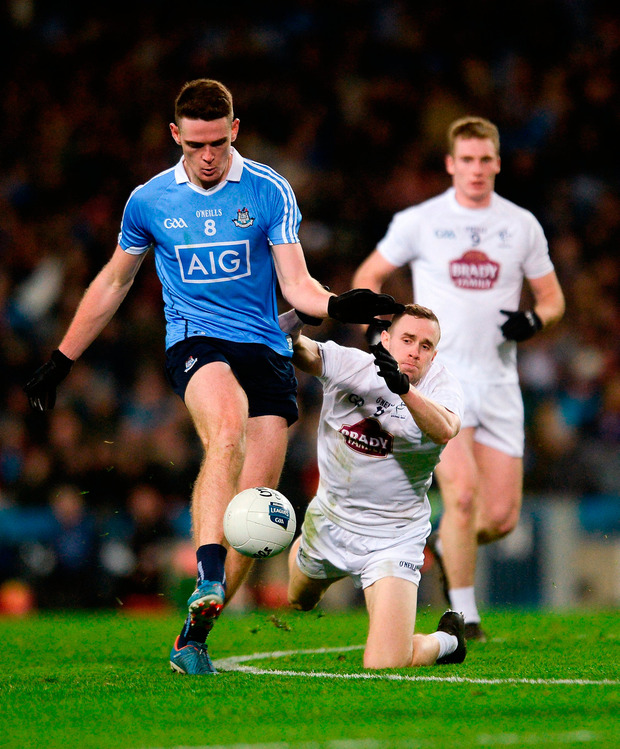 Trailing by two at the break (1-6 to 0-7) and struggling for traction in many areas, the Dubs were awoken from their slumber just before half-time when a push from Kildare's Niall Kelly led to consternation and a brief melee. It was a classic case of poking the bear and upon the resumption a different Dublin emerged - powered by a midfield masterclass from Brian Fenton - as a 15-minute blitz yielded 2-5 to turn the game from contest to canter in front of 26,027. Goals from Fenton and Dean Rock rocked Kildare's confidence and left the chasing pack in no doubt about Dublin's rude health. For Lilies boss Cian O'Neill, it was a stark realisation of the demands of top-flight football, where mistakes are magnified. "A quality side were ruthless. We exposed ourselves, turned the ball over way too much, lost control of our kick-out strategy - and they're as ruthless as quality champions are. We were the architects of our own downfall in many things out there," he said. If teams of Dublin's calibre get an inch, they will take a mile, but O'Neill feels they can learn from their "solvable" mistakes and display greater calm if the wheels begin to come off in future. "They (Dublin) reminded me of Kilkenny in the second-half, in the noughties, where they don't just bang in one, they bang in two - ruthlessly and efficiently, in a very short period of time, and put games to bed. But we need to take responsibility for our actions. "The two goals were both solvable, but we need to learn very, very fast. That's what I meant by we contribute to it ourselves - we almost try to go faster, harder, more direct instead of playing it through the hand or through the lines, we were kicking the ball away and they were coming at us again." O'Neill also hit out at what he claimed was a "cynical" hit on midfielder Kevin Feely, an incident that he felt contributed to his side's downfall. While O'Neill did not go into specifics, he insisted it was a calculated move. "There's obviously a very strong correlation between when Kevin's commanding midfield and when we're performing strongly in games," he said. It was quite cynical in terms of what happened and the impact to his head when he was on the the ground, but maybe that's what the best teams do better than what we do. It's something we have to look at. "But when he got injured we went out of the game in midfield, that's when the goals came and to be fair, it wasn't his head but his calf that tightened from a bang he got on his leg which is why we moved him inside to see id we could get anything out of that. "Ultimately, he wasn't feeling good so we just took him off. He's such a big player for us. Every team has them and it did impact on us unfortunately." 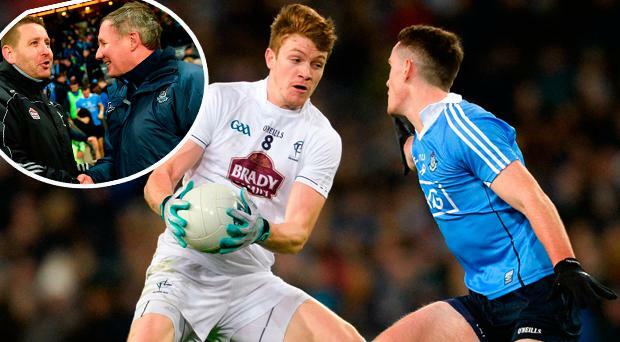 Despite a comfortable victory, Jim Gavin's Dubs were uncharacteristically off-colour in the opening exchanges as they showed clear signs of ring rust and Kildare took advantage. When a skewed effort from Paul Cribbin looked to be drifting wide, the Dublin defence switched off, but Luke Flynn - younger brother of Daniel and making his league debut - expertly collected before slotting through the legs of Stephen Cluxton in front of a shocked Hill 16. 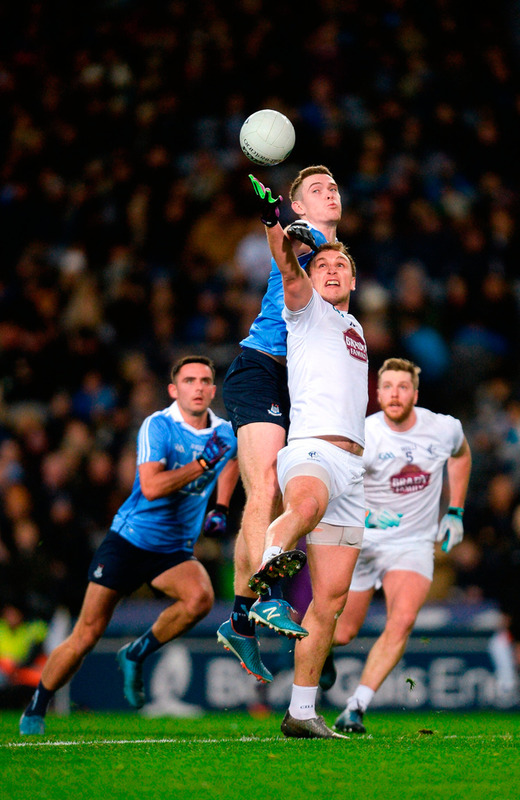 Dublin's response was a familiar one and as Ciarán Kilkenny began to pull the strings from centre-forward, they reeled off the next five points as Rock (two frees), Niall Scully and Bernard Brogan all found the target to lead 0-5 to 1-1. Daniel Flynn was a constant threat at the other end, however, and after winning a free which Kevin Feely converted, the Johnstownbridge attacker blazed over after showing the Dublin defence a clean pair of heels. 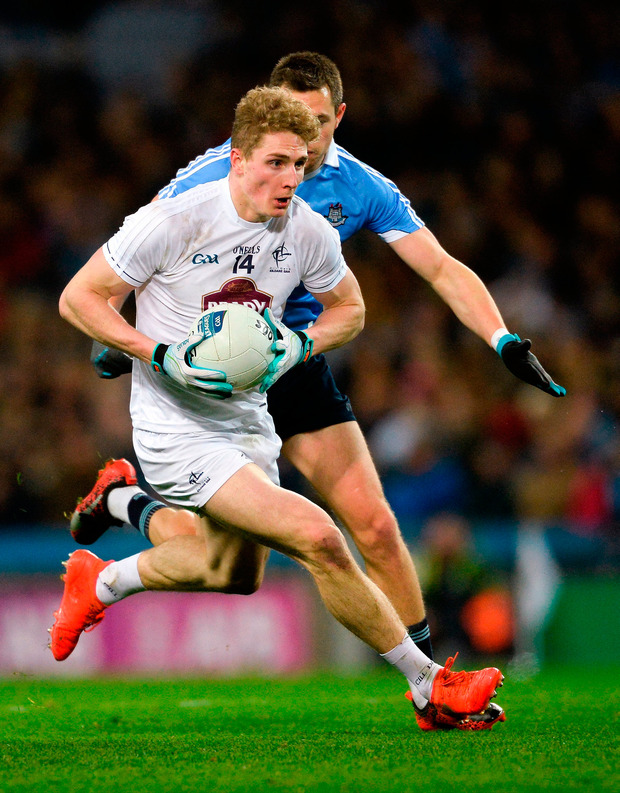 Kilkenny and Fenton responded for the Dubs, but it was all Kildare in the closing stages. Paul Cribbin kicked a fine point, but they were left to rue seven first-half wides and further chances to hit Cluxton's net. Colm Basquel was caught napping and Eoin Doyle's brilliant interception ended up in Daniel Flynn's hands. He turned sharply, but with the goal at his mercy, and Doyle on the overlap, his rising shot tipped the crossbar and went over. A long-range free from Mark Donnellan concluded the scoring. The second-half was nothing like the first as Fenton bombed forward to kick two early points, while Scully and Rock both spurned goal chances. However, better was to follow. With Brogan - used predominantly as an impact sub last year - acting as the creator in chief, Rock fired past Donnellan before two-time All-Star midfielder Fenton brought his tally to 1-3 when shredding the Kildare defence. Basquel and Raheny's Brian Howard added further scores and enhanced their reputations as the Dubs killed off the game, much to the delight of Gavin. "Both of those guys took the decision to stay home and to apply themselves to the pre-season tournament and from that they get the reward of tonight," he said, before outlining his dislike for early-season games. "I don't understand why we play football in January, the players should be with their clubs, that's the way I see it. "We just play seven games in the league, it should take seven weeks. It shouldn't mean we play three games, we take a break of two weeks and play another two and take a break of two weeks and play another two. To me, it doesn't make sense." With the same backroom team in place for 2018, the Dubs left the chasing pack in no doubt about their rude health ahead of their trip to Tyrone next Saturday, while Kildare's second-half contribution was limited to four frees and a spectacular last-minute goal from Daniel Flynn. "The league is never going to be won, lost or defined by any one match, but we've really got to learn from the mistakes and turn things around," O'Neill said. Much to ponder for O'Neill, but business as usual for the Dubs.